On 6th May 1886, a 43-year-old priest named Edward Handley was presented with the living and patronage of All Saints Winthorpe, which was at the time a run-down, largely Georgian church in which it would appear the parishioners risked their lives every time they entered as it was widely stated that the roof could fall in at any moment due to rotting timbers. Fortunately, Revd Handley was a wealthy man and he vowed to provide a suitable place of worship for the Winthorpe villagers, which would stand as a beacon of God’s glory for many years to come. To give some idea of how wealthy he was, he actually paid for the rebuilding of the church himself, at a rumoured cost of £7,000. It doesn’t seem like much for a building like this, but when inflation is taken into account, in today’s money that is approximately £833,000. As some of you will know, the Handley family had a long association with Winthorpe – the family vault lies under the current vestry, and members of the family had been rectors and patrons of the church. Edward Handley would build the new church in memory of his 2nd cousin Philip Handley, who had died two years previously in 1884, and had been the patron of the church until his death. Now, before being made rector of Winthorpe, Edward Handley had been living some of the time in his family seat, Muskham Grange at North Muskham, which no longer exists because it was knocked down to make way for the A1. Anyway, it might seem like a strange thing to do when you’ve just been made rector of a parish, but in 1886, Revd Handley decided to move out of Muskham Grange permanently and take up full-time residence in Bath, where he had been an assistant priest at St Mary’s, Bathwick for many years. In effect he became what was called an absentee rector, and the day-to-day running of the parish of Winthorpe was left to his fortunately highly capable curate, Revd William C. Leeper. The influence of Revd Handley’s time at St. Mary’s Bathwick on the subsequent design of our current church cannot be overstated. 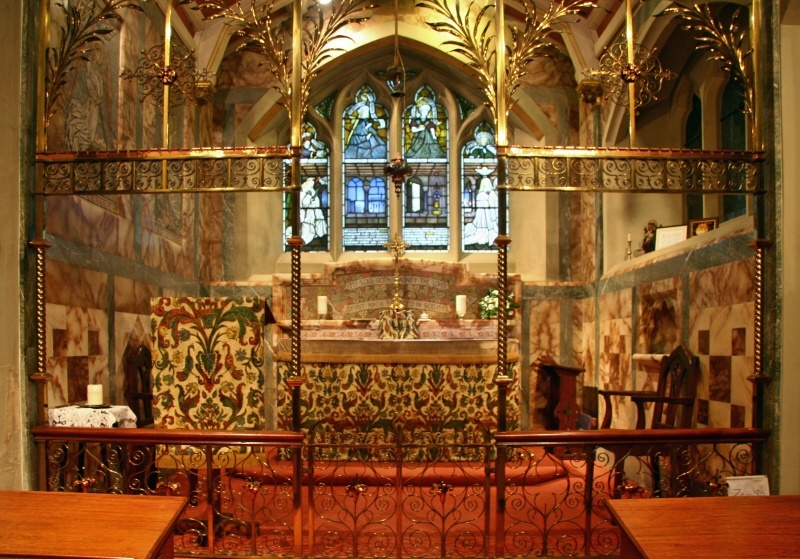 In 1886 a new lady chapel was in the process of being installed at St Mary’s. It had been designed by one Sidney Gambier Parry, and having visited the church I can say that the Lady Chapel is absolutely stunning. The walls are covered in marble, in intricate designs and the screen is wrought from what looks like metal covered in gold leaf. It is incredibly impressive, and Edward Handley must have thought so too because of course he appointed Sidney Gambier Parry to be the architect for this church in Winthorpe. Many more craftsmen who had most likely worked on the church in Bathwick, such as stonemasons, blacksmiths, etc. were also engaged to work on our church too. It didn’t take long for the demolition and rebuilding work to commence. In just under six months since Revd Handley had become the rector of Winthorpe, a temporary iron church (affectionately known as a tin tabernacle) had been erected in the churchyard, the old church had been demolished, and on (1st Nov.) All Saints Day 1886, the foundation stone was laid by Sir Henry Bromley, baronet of East Stoke Hall. After only 18 months or so, the building of the church was complete. The date of the consecration service was to be 7th June 1888, but sadly the Bishop of the newly created Diocese of Southwell, George Ridding, was too ill to attend. The service was rescheduled for 19th June in the hope that the bishop would have recovered sufficiently, but it was not to be, and the Bishop of Lincoln, Edward King, was fortunately able to step in instead. The Bishop of Southwell did actually recover and went on to live for another 16 years, so although obviously incapacitating, whatever ailed him was not immediately terminal. So, on 19th June the village of Winthorpe was about to celebrate it’s most joyous event in some years, and most likely for some years more to come, since the world had been in the grip of a “Great Depression”, which began 15 years previously and would continue for 8 years more. Incidentally, just four days previously, the country and indeed most of Europe had been shocked by the death of Kaiser Frederick III of Germany, on 15th June. He was married to Queen Victoria’s eldest daughter, Princess Victoria, and there was a great deal of national sympathy for the royal family at this time. Back to 19th June, and despite the preparations for the consecration service, church life had been going on as normal, and there had been an early Eucharist held in the iron church, presumably for the benefit not only of the people who would be attending the special service, but also for those who would not be able to get in because it was for ticket holders only. At 10.30am the churchwardens, Mr Ringrose and Mr Johnson, carrying their new staves of office, opened the doors to the new church and began letting in the congregation, who rapidly filled the church long before the service was due to start at 11am. While they were waiting, Mr H.J. Davis of Christ Church, Bath, and previously of St Mary’s Bathwick “extemporised some pleasing music on the organ”. At 11 o’clock the procession began at the church door headed by the church wardens, and then followed the cross-bearer (from St Mary’s Bathwick), the choir (again, augmented by choristers from St Mary’s Bathwick), 28 members of the clergy from Nottinghamshire and Lincolnshire, the Rector Edward Handley, the Curate in Charge, William C. Leeper, the Archdeacon of Nottingham, the Bishop’s Chaplain, and the Bishop of Lincoln. The hymn “All people that on earth do dwell” was sung while the procession passed up the nave, and the bishop sat on a temporary throne on the north side of the altar – it could well have been the chair we see there today. How many people can be fitted into this church? Apparently there were 320! The first part of the service was the Consecration, during which the Bishop went in procession around the church saying a prayer at the font, on the chancel steps, in the body of the church, at the lectern, the pulpit and finally at the altar. The sentence of Consecration was read by the Registrar of the Diocese, dressed in wig and gown, as they still do nowadays for this sort of occasion, and then it was handed to the Bishop to sign. Immediately following the Consecration, Holy Communion was celebrated by the Bishop who also preached the sermon based on the first book of Chronicles chapter 29, verse 1 “The work is great, for the palace is not for man, but for the Lord God”. The choir sang beautifully at appropriate times during the service, and the Eucharistic musical settings were by Richard Redhead. The hymns included all four of the ones we are singing today. At the end of the service, as the congregation left, the organist played the Hallelujah Chorus by Mr George Frederick Handel which I will try to recreate! At two o’clock, a luncheon was provided under a large tent, with Mr Joseph Gilstrap Branston J.P., occupying the chair. The Bramston’s lived at Winthorpe Grange which no longer exists, but used to be where The Spinney estate is now. There were many notable local people present, and there were 15 toasts proposed along with accompanying speeches; it must have gone on forever, but when the speeches had finished, the celebrations were concluded. Christine Hasman. (member of Winthorpe PCC) August 2016. 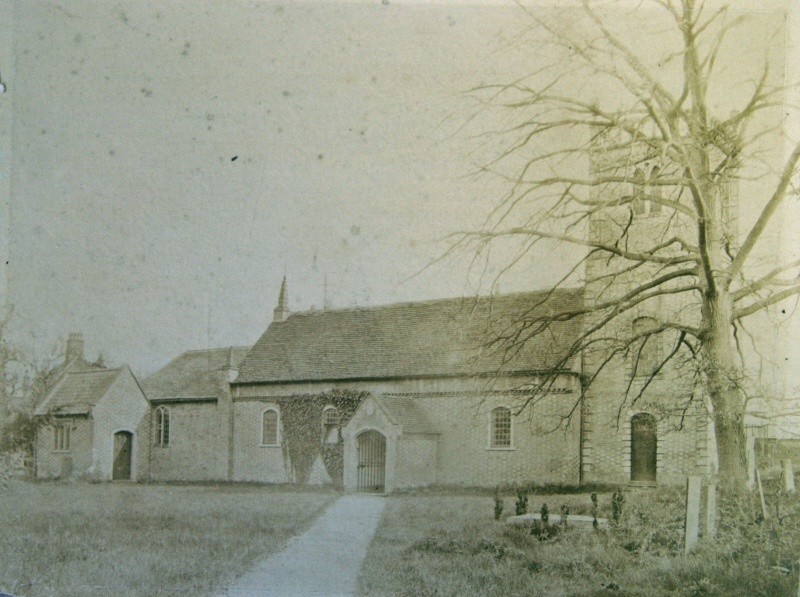 All Saints' Church, Winthorpe - 1880. The Lady Chapel, St. Mary's Church, Bathwick. The Altar, All Saint's Church, Winthorpe - 2013. All Saint's Church, Winthorpe - 2004.